Does your child want an Avengers Birthday Party? Superhero mom (or dad) to the rescue! 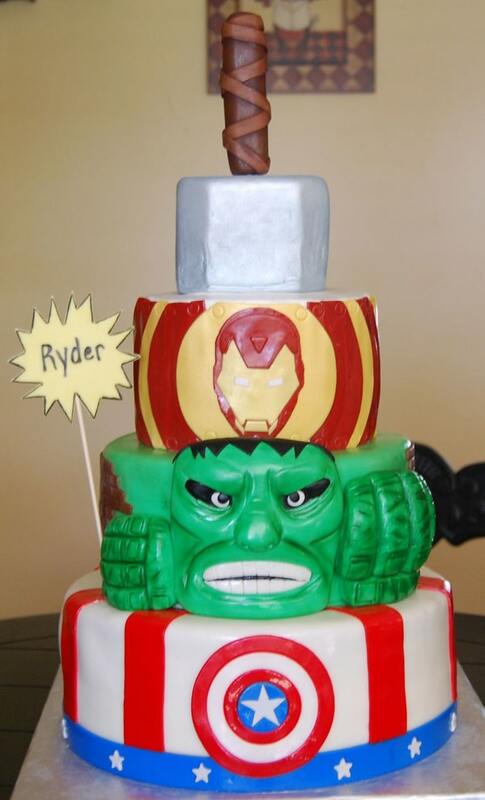 Start planning with these 10 Awesome Avengers Cakes! The Avengers film series took the world by storm. With the success of the first Iron Man movie, Marvel delighted fans from all over the world by following it up with a series of films called the Avenger series. Currently, kids and adults alike are anticipating the next movie like no other. If your kid is an Avengers fan, like millions of other kids (and adults) from all over the world, then he would absolutely be thrilled to have an Avengers birthday party. With cool characters such as Captain America, Iron Man, Thor, the Hulk, Black Panther and so much more, your little boy will never run out of options when choosing which birthday costume to wear. Your guests, especially the dads, will also be thrilled with your Avengers themed birthday party. We’re telling you, it’s gonna be a hit! But before you really start planning the most amazing Avengers Birthday Party, you need to decide on one of the most important details … an Avengers Cake!!! 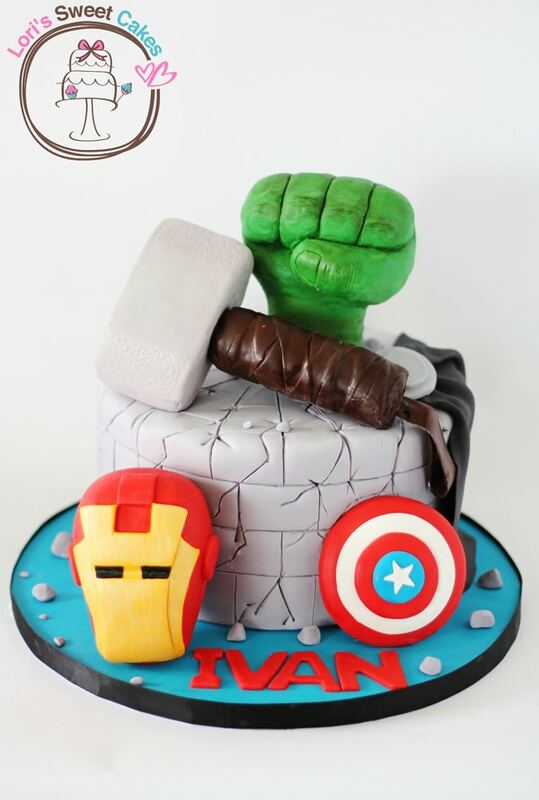 With the rise in popularity of the Avengers, it comes as no surprise that kids would want an Avengers-themed birthday party, and what better way to make that birthday complete than with an Amazing Avengers cake! So if you’re ready to start planning a Marvel Avengers-themed party for your little guy, check out these 10 Awesome Avengers Cakes for some great inspiration! 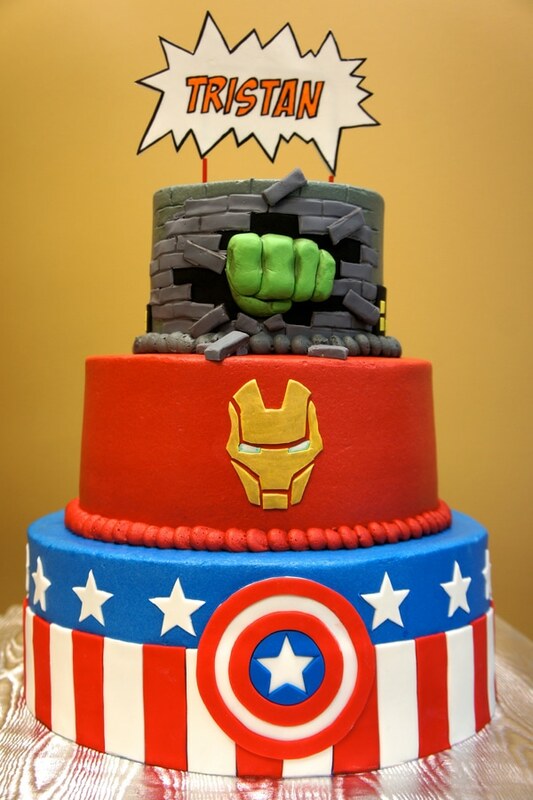 From Captain America to Iron Man, to the Hulk, and Black Widow, there are so many cake designs to choose from. Do you have a favorite? I know it’s so hard to choose because they are all pretty awesome! Cake Idea #1: Have a look at this Avengers Super Heroes Cake by kiraboo. If you want to know how to decorate an Avengers cake, then get inspired by this three-tiered superhero number. Check out the Hulk’s fist smashing all those bricks! With such cool details from Captain America, Iron Man, and the Hulk, this cake is sure to be a hit with your little boy and all his friends! 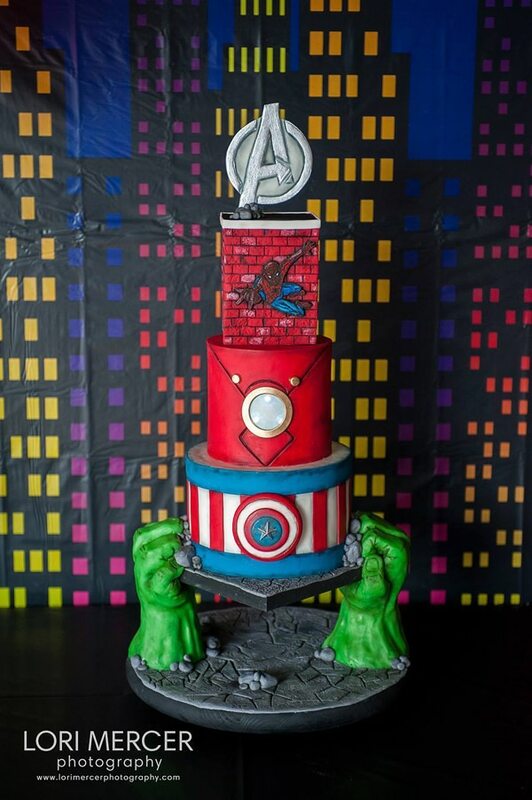 Cake Idea #2: Here’s an awesome Avengers Cake by Lori’s Sweet Cakes. We’re loving how all the symbols of the characters are combined in this adorable cake. Check out the Iron Man’s cool mask. And how about Thor’s hammer, the Hulk’s fist, and Captain America’s shield? This cake is sure to be a hit with your little superhero and his friends! 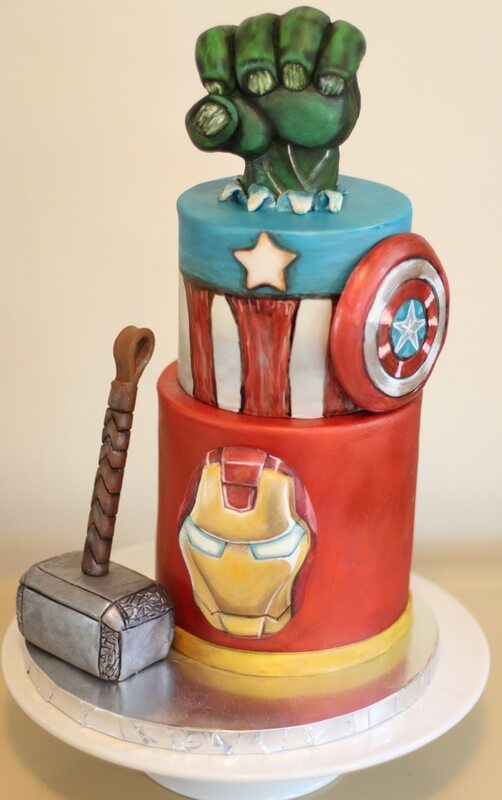 Cake Idea #3: Looking for an Avengers cake with a little more oomph? WOW! This Avengers Birthday Cake by ArtistInTraining07 is sure to delight your superhero. This three-tiered, Avengers cake would be the perfect centerpiece for your dessert table. If you don’t have the time to bake a cake, just get a regular one, top it off with black fondant, then recreate the details. Or to save some time, skip the hassle and just show this design to your local baker and have them deliver the cake in time for the birthday party. That way, you’ll have plenty of time to perfect your Avengers decorations. Cake Idea #4: Wow! Now, this is one cool Avengers Tower Cake by sweetsby1. Instead of just using symbols from each character, this cake features nothing less than the Avengers’ headquarters itself. Check out the helipad on the side of the cake. Oh, and look! There’s even a little spider to symbolize Spidey. What a fabulous idea! 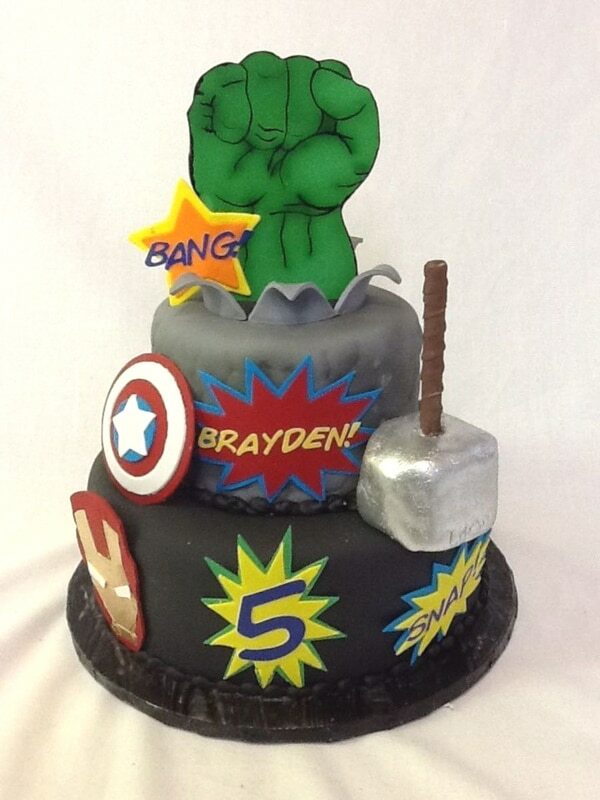 Your little boy would be thrilled to have this Avengers cake for his birthday. This cake is sure to delight and thrill your guests as well. What are you waiting for, supermom? Cake Idea #5: Now this is a cake fit for superheroes! Come and check out this awesome Avengers Cake by Lori Mercer Photography. From the Hulk’s fists to the cake topper using the Avengers’ logo, the details are spot on and are absolutely amazing. Guests would be thrilled and some are sure to post this on Instagram. It will look stunning on your dessert table next to some Avengers cupcakes, cake pops, and other goodies. If you’re looking for something amazing, then this cool Avengers cake won’t disappoint. 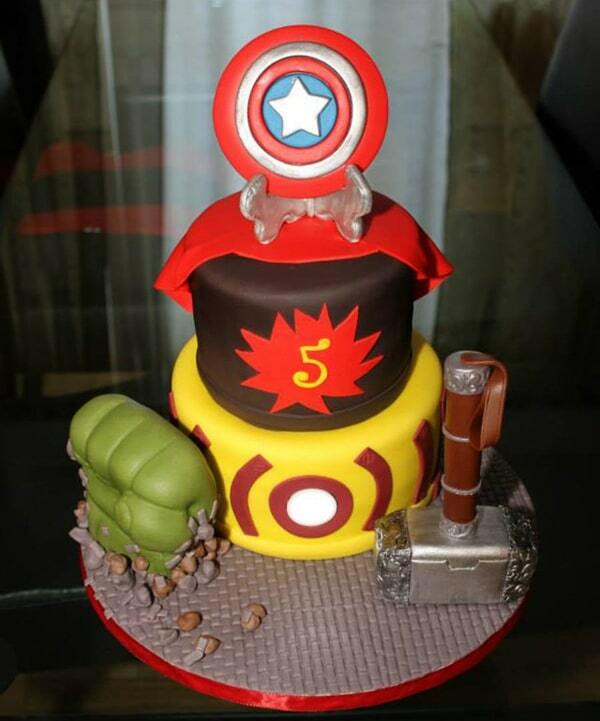 Cake Idea #6: Check out this adorable fondant Avengers Birthday Cake by Tamimisha. Everything is possible when you’re planning on having an Avengers cake. Can’t decide on one superhero alone? 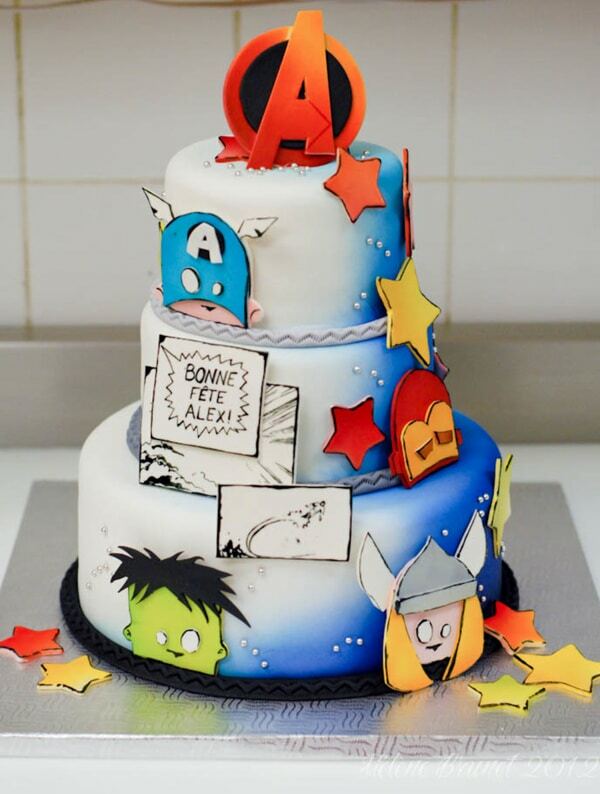 This tiered birthday cake is perfect if you’re looking to mix several superheroes in one awesome cake. If the Hulk is your little guy’s favorite, then he’ll be thrilled with this cake. Cool, huh?! Cake Idea #7: Get ready for Infinity war with this lovely Hand-Painted Avengers Cake by KO-sCakes. Let the Avengers heroes come alive with this super fab cake. Just check out the details on Thor’s hammer. We’re loving how Captain America’s shield is incorporated on the cake and the red, blue, and white stripes look pretty amazing. And how about Hulk’s fist as the cake topper? Hulk Smash! Cake Idea #8: Serve it up, superhero style with this marvelous Avengers Birthday Cake by pookie40. 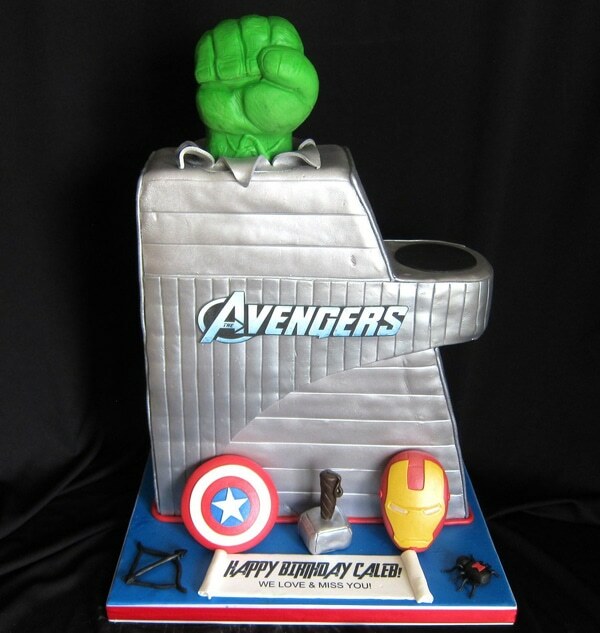 This cute cake deserves to be the centerpiece of your Avengers-themed birthday. Each yummy layer of this cake pays tribute to the awesome characters of the Avengers squad. The question is, which one is your favorite? Cake Idea #9: Superheroes deserve a super cake. And this Avengers Cake by Georgia12 is sure to make your young superhero very happy! We can’t get over the fine details of the hammer. And how about Dr. Strange’s cape? Whether he’s rooting for the mighty Thor or for the strongest teammate of the Avengers, the Hulk, or for the captain of the team, Captain America, he won’t be disappointed with this number. Cake Idea #10: If you’re looking for something unique, this comic book style Avengers-Inspired Birthday Cake by buttercreamfantasies is too cute for words. We’re loving the cut outs and how cool is the birthday sign?! If you’re after a similar cake, you can just print the toppers and add them to your cake. Just don’t forget the stars! Your little boy and his friends would absolutely love it! 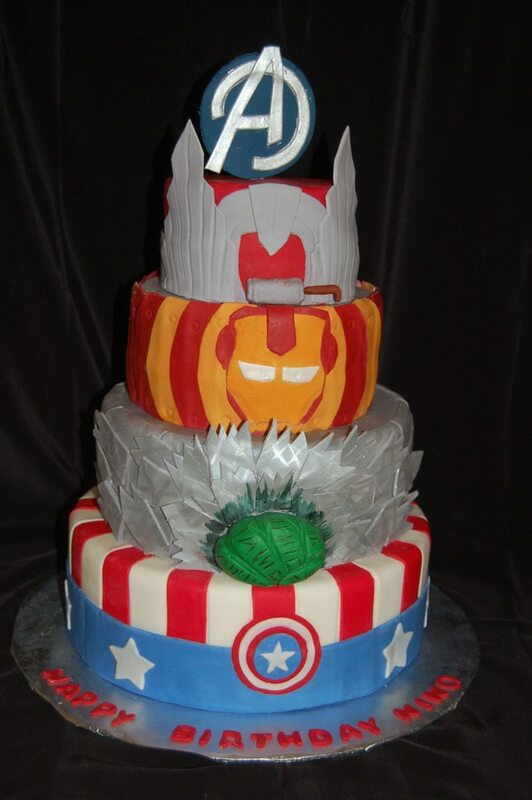 Which of these 10 Awesome Marvel Avengers Cakes do you prefer for your superhero’s party? Let us know in the comments below! Looking for more party ideas? Don’t forget to follow us on Instagram @prettymyparty and Pinterest and join us in our private Facebook group.